Happy Earth Day! I hope you are doing your part to promote a clean environment. It doesn’t matter if you live in a big city, a small suburb, or somewhere in between – every little bit helps! As part of my commitment to the modern environmental movement of Earth Day I started in my very own apartment. A big part of helping the environment is reducing waste in our landfills. As I was going through some old clothes, I came upon a bunch of pairs of jeans that were too worn out to donate to charity, but I didn’t want to just throw them away. What a waste! So I decided to make them into a crocheted rag rug. So I picked out some colors to go together and started cutting. I cut the jeans into 1″ strips and I cut the t-shirts into 1.5 – 2″ strips. In some of the rag rug tutorials I looked at I saw that they rolled the strips into balls, but I didn’t really find the need to do that. The strips were so thick that they didn’t really run the risk of getting tangled. 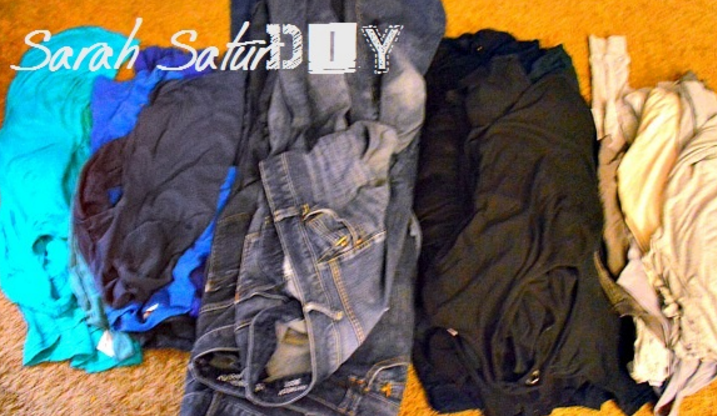 Here’s my one tip: try to keep each t-shirt and/or pair of jeans in just one strip if possible. It really helps things when you don’t have to connect all the strips together. Basically I cut the jeans strips starting at one pant leg and then circled around to the other. For the t-shirts I just started at the bottom and did a lot of curving around as I cut.